In all air-conditioned living and commercial spaces is essential to place an ionizer to enrich the air which is depleted due to air conditioning. In such depleted enviroments we start to feel exhausted soon, because all the negative ions from the air are destroyed on their way through the air-conditioning. Some air-conditioning devices have ionizer already built-in, but attention is needed in selecting the right one. The experts have determined that the source of negative ions at most of the air-conditioning devices is not built-in on the right place, because the ionizer is placed in the middle of the air-condicioning system. In this case the negative ions must pass through the air-conditioning device and through filters which destroy them and the result is depleted air coming out of the air-conditioning again. Some air-conditioning devices offer to clean the air by so called plasma or metal needle, but all of them start producing harmful ozone after some time. There are also air-conditioning devices equipped with a great range of different filters. Unfortunately these filters cannot efficiently purify the air, because there is no filter in the world that is able to stop hazardous sub-micron particles to avoid their accumulation in the lungs. Only negative ions can remove these particles from the air. Besides the fact that these filters are only partly efficient a buyer must clean the filters and replace them with the new after some time. The best thing to do is to buy an air-conditioning without ionization and buy a strong portable ionizer separately. This ionizer will certainly enrich the air in air-conditioned and other spaces. The negative ions are not important just for enriching the air and the well-being, but also for alleviating the problems with allergies and asthma, because they lower the level of histamine in the blood and remove all the allergens and mite faeces from the air. The beneficial effect appears to people in stressful situations as negative ions lower the level of serotonine H5 (neurohormone that is a result of stress), they balance the blood pressure and have a favorable influence on the problems with thyroid and healing of the wounds. 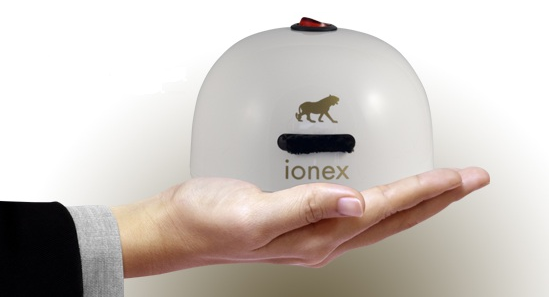 Besides all this the air-conditioning devices with a built-in ionizer are at least expensier as those without ionization That is why it is better to buy a portable ionizer IONEX with a carbon brush, which does not produce any harmful ozone and operates completely silently. If necessary, you can transport the ionizer to other places or carry it with you to working place since it is so small that you can put it in the bag.